The large marquee of Victory Garden’s Biograph Theater in the northerly Chicago neighborhood of Lincoln Park announces a regular slate of upcoming live performances. The building is a popular cultural destination for Chicagoans and features a 299-seat theater, a 130-seat studio theater, rehearsal hall and space for special events, but the building has enjoyed a long and storied history. First opened in 1914 with 942 seats, the Biograph Theater was one of the country’s earliest movie houses. During the Great Depression, the theater advertised a rare summer perk: air conditioning. Perhaps this is what drew notorious gangster, bank robber, and alleged murder, John Dillinger, to a screening of “Manhattan Melodrama” in July, 1934. Leaving the screening, Dillinger was killed in the adjacent alleyway by waiting FBI agents. 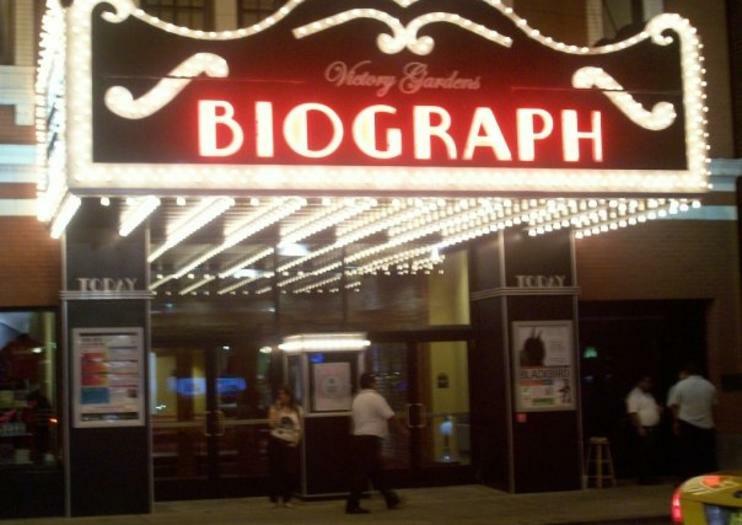 As the site of Dillinger’s death, the Biograph Theater has also become a popular for ghost hunting tours. The Biograph Theater is located at 2433 N. Lincoln Ave. The area is serviced by several city bus routes, and the theater provides valet service one hour before curtain for $13 per hour. A nearby parking garage has rates from $6/hour. Admission is based on the performance and seating location, and children under the ages of 6 are not permitted. The venue has a concession stand and coat check. Shows in season generally have a multi-week run, with popular show times at 3pm and 7:30pm — check the theaters’ online schedule for full performance listings, dates, and times. Subscription membership is also available. Discover the ‘dark side’ of the Windy City thanks to this 2.5-hour, bus-based, nighttime crime history tour of Chicago. Explore the lives of notorious mobsters like Al Capone, Frank Nitti, Bugs Moran, and more as you explore infamous crime scenes like the St. Valentine’s Day Massacre, learn about ‘The Enforcer’s Safe,’ and stop by local watering holes. Chicago’s mob history has long been immortalized in popular media. Embark on this Chicago Gangster Tour to learn the true story. With an expert historian as your guide, you’ll visit notorious hangouts of John Dillinger, The Untouchables, and the legendary Al Capone. You’ll stop at former speakeasies, historic hotels, and epic crime sites like that of the Saint Valentine’s Day Massacre.